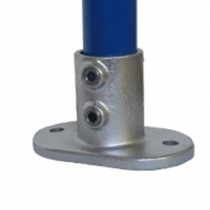 Base flange, usually used for uprights on level sites. Fixing holes suit a wide range of common mechanical and chemical masonry anchors which we should be pleased to quote for on request. Type 132-D48 is designed to meet the dimensional requirements for parapets as defined by BS7818:1995 (Pedestrian Restraint Systems in Metal). Warning: To achieve optimum load characteristics, this fitting should be fitted so that the fixing holes are in line with the applied load.